From time to time, Italian Spiderman and Alrugo appear in the media, either on TV or inside the interwebs. If you aren't googling us on a daily basis, you may have not been witness to such 'spidersploitation' in the press. SO, from now on, I'll be posting links to magazine interviews, newspaper reports and basically any videos which reference our italian megahero. More news-press coming soon. 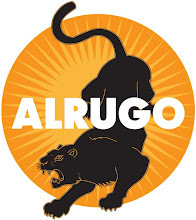 There's tons more alrugo-related press out there, I just like keeping you in suspenso. The one question burning in my mind regards Marvel Comics. I get the feeling that once you begin to make money off this project, they're going to want at least part of it. "A pioneering feminist." I laughed at that one.